Mac Ionnrachtaigh book tells the untold story of the truly groundbreaking linguistic and educational developments that took place among republican prisoners in Long Kesh prison from 1972-2000. 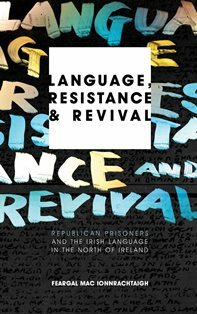 During a period of bitter struggle between republican prisoners and the British state, the Irish language was taught and spoken as a form of resistance during incarceration. The book unearths this story for the first time and analyses the rejuvenating impact it had on the cultural revival in the nationalist community beyond the prison walls. Based on unprecedented interviews, Feargal Mac Ionnrachtaigh explores a key period in Irish history through the original and "insider" accounts of key protagonists in the contemporary Irish language revival. The New York launch takes place on Wenesday, April 24th at 7.30pm at William Barnacle’s Tavern (Theatre 80, 80 Saint Mark’s Place, NY 10003. www.theatre80.net) On April 25th the author will speak at Emerson College in Boston.